The Smithsonian Institution is a world-renowned complex of 17 galleries and museums (11 of them in the District of Columbia). Together they house over 140 million objects documenting everything from the origins of man to space exploration. One of the 11 buildings in Washington D.C. is The National Museum of American History. There you will find an amazing collection of artifacts which document the story of our Nation. 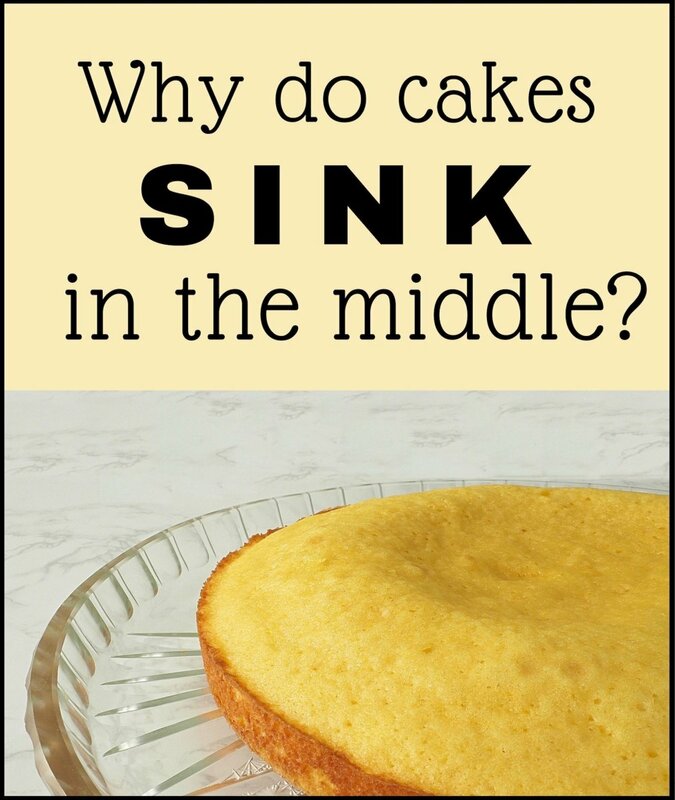 Yes, the iconic funny-shaped cake pan with a hole in the center is immortalized in a display which focuses on American culture and how businesses and inventions made an impact on consumer tastes in the 20th century. 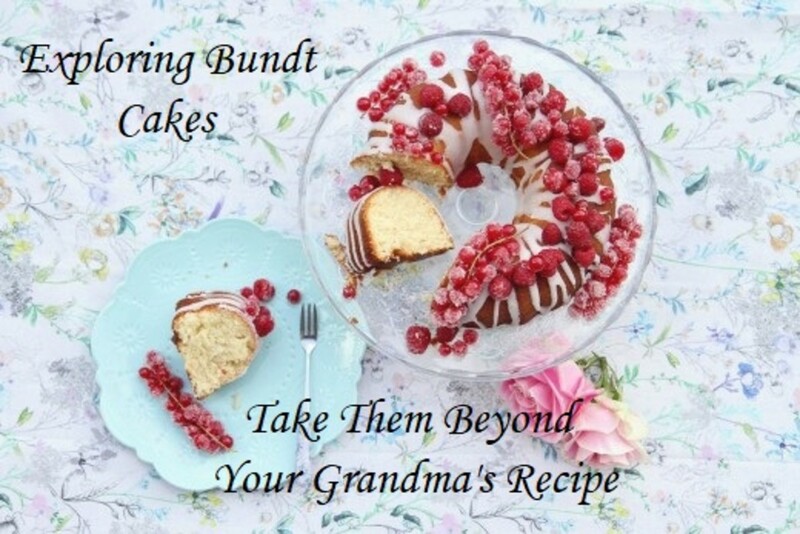 Why Is It Called "Bundt"? Etymologists tell us that the word "bundt" comes from the German language; it refers to a band or bundle, perhaps the flutes of the pan were thought to resemble a sheaf of wheat, bundled together and tied with twine. So one can assume that the bundt would be a cake to celebrate the harvest. So Why is it a Part of Americana? Well, the story is new enough that I think we can call it fact rather than legend. In 1948 H. David Dalquist and his wife purchased the company Northland Aluminum Products, a manufacturer of Scandinavian bake ware. They renamed their product Nordic Ware. A decade later, a group of Jewish women from the Hadassah in Minneapolis, Minnesota wanted a baking pan similar to what they had used in the Alsace, France. They approached Nordic Ware with their request, and Mr. Dalquist fabricated the first bundt pan made of aluminum. Why was this pan so important to that group of women in Minneapolis? noun -- a sweetened bread, flavored with raisins and almonds, baked in a ring-shaped mold, and usually dusted with powdered sugar before serving. 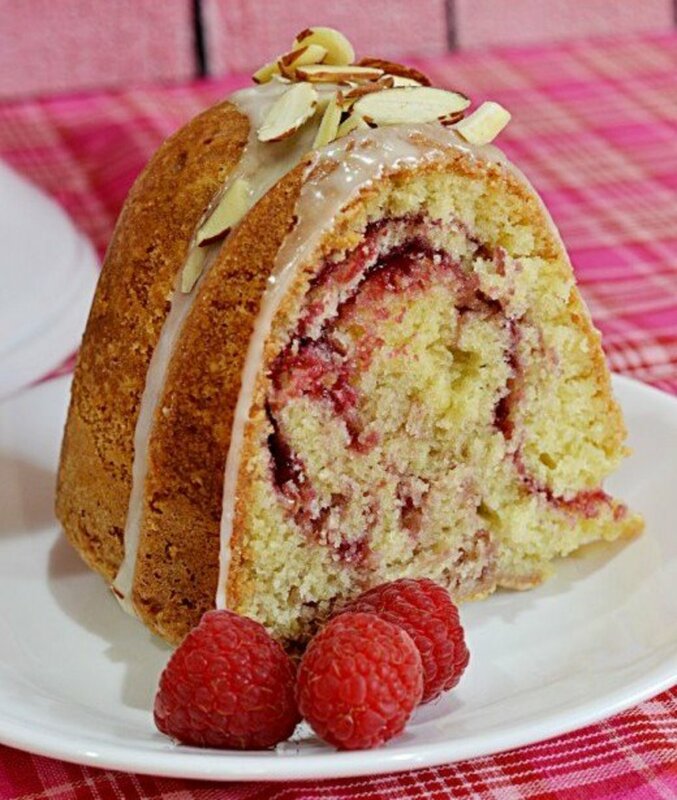 There is nothing in the world quite like kugelhopf. Not a really a yeast bread, but not quite a cake either; it falls somewhere in between. Sweetened yeast dough studded with raisins and almonds, baked, unmolded, and then given a baptism of sweet creamery melted butter and an ethereal dusting of sugar. Dorie Greenspan, the doyen of everything blissfully baked, has an amazing recipe which she shared with the readers of Leite's Culinaria. . In 1963 the New Good Housekeeping Cookbook hit the book shelves; contained therein was a recipe for a cake...baked in a bundt pan. Suddenly everyone in America wanted one of those pans. They toyed with them; they baked and experimented. And in 1966 the Tunnel of Fudge cake was a finalist at the Pillsbury Bake-Off contest. In 1972 a Bundt Streusel Spike Cake was the Pillsbury grand prize winner -- 11 other top winners also used (you guessed it) a bundt pan. 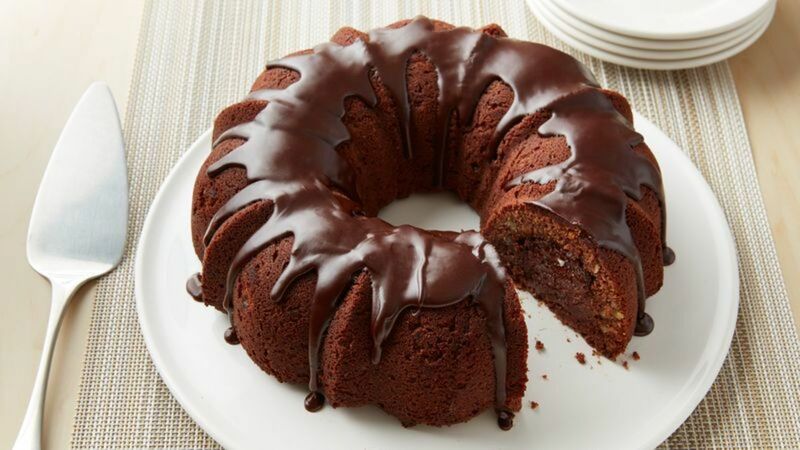 Pillsbury recognized this an an opportunity to expand their marketing and so developed a line of bundt cake mixes; in the first year of production the Pillsbury company earned more than $25 million in sales on this new product. Grease and flour a 10-inch tube cake pan and set aside. Cream butter in large mixer bowl at high speed of mixer. Add eggs, one at a time, beating well after each. Gradually add sugar; continue creaming at high speed until light and fluffy. 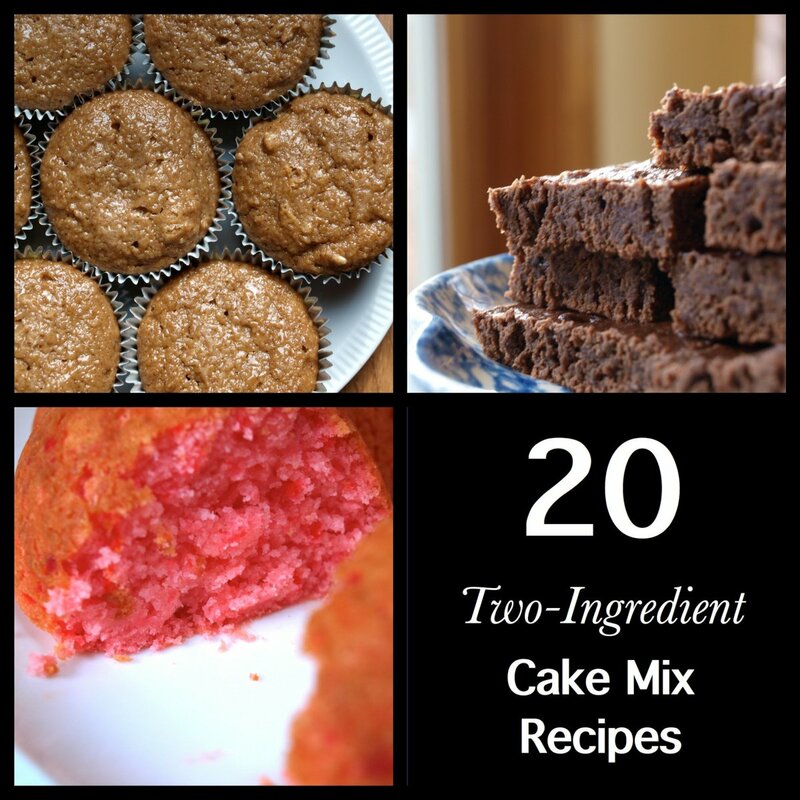 By hand, stir in flour, frosting mix, and walnuts until well-blended. 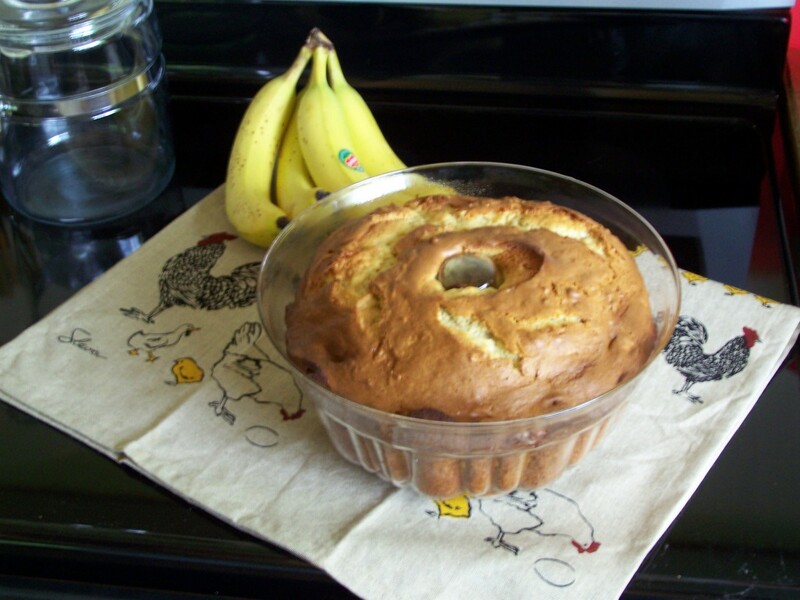 Pour batter into greased Bundt pan or 10-inch Angel Food tube pan. Bake at 350 degrees for 60-65 minutes. Cool 2 hours; remove from pan. Cool completely before serving. NOTE: Walnuts, Double Dutch Fudge Frosting Mix and butter are key to the success of this unusual recipe. 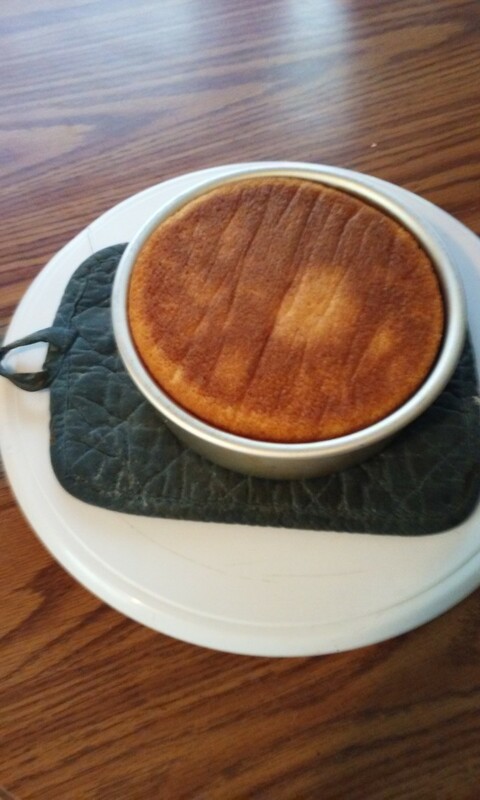 Since the cake has soft a fudgy interior, test for doneness after 60 minutes by observing dry, shiny brownie-type crust. There is one bit of bad news however. Pillsbury no longer manufactures dry frosting mix, so it is no longer possible to create this cake exactly as the recipe is written. But, the New York Times has come to the rescue, developing an updated version of the original Tunnel of Fudge. What About Recipes for Today? 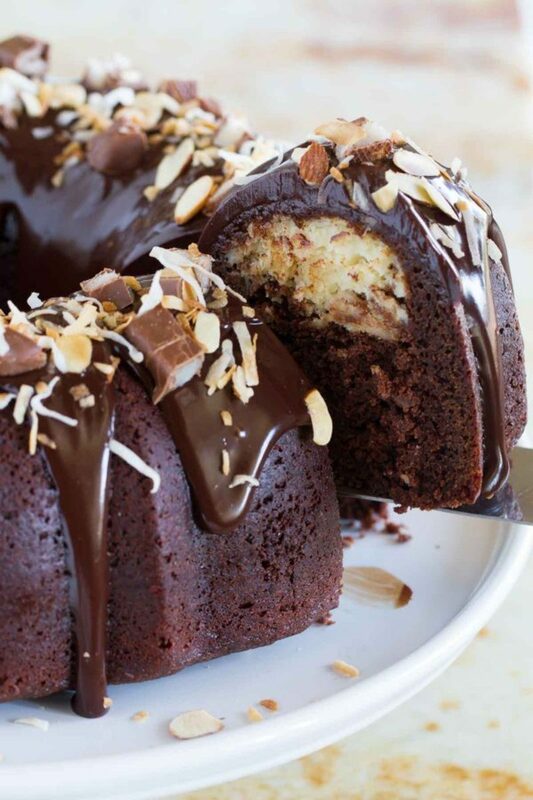 Let's be realistic—any cake can be baked in a bundt pan, but to me, that doesn't qualify it as a bundt cake. 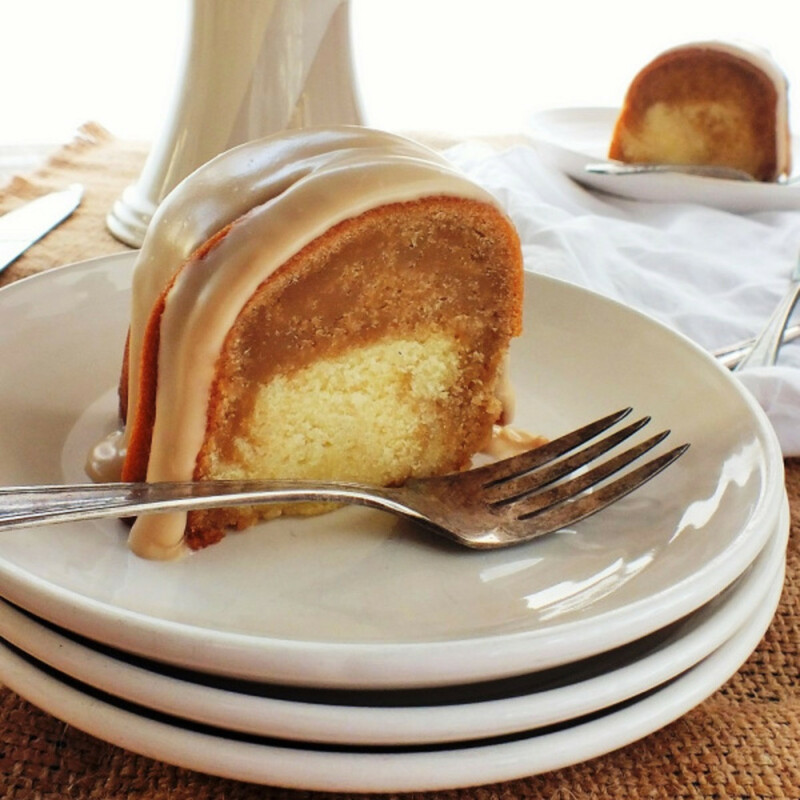 Looking back at the history of the cake, which began in 1966, I think that a bundt cake should contain a tunnel of sugary, sticky sweetness in addition to the surrounding cake. So here are my nominees for 21st-century bundt cake wonderfulness. Deborah Harroun has been blogging for ten years; she develops family-friendly recipes and anyone can make--many take an hour or less. This cake is dense and chocolaty and filled with the coconut--it tastes just like an Almond Joy candy bar. I have mentioned Sally (of Sallysbakingaddiction.com) in previous articles. 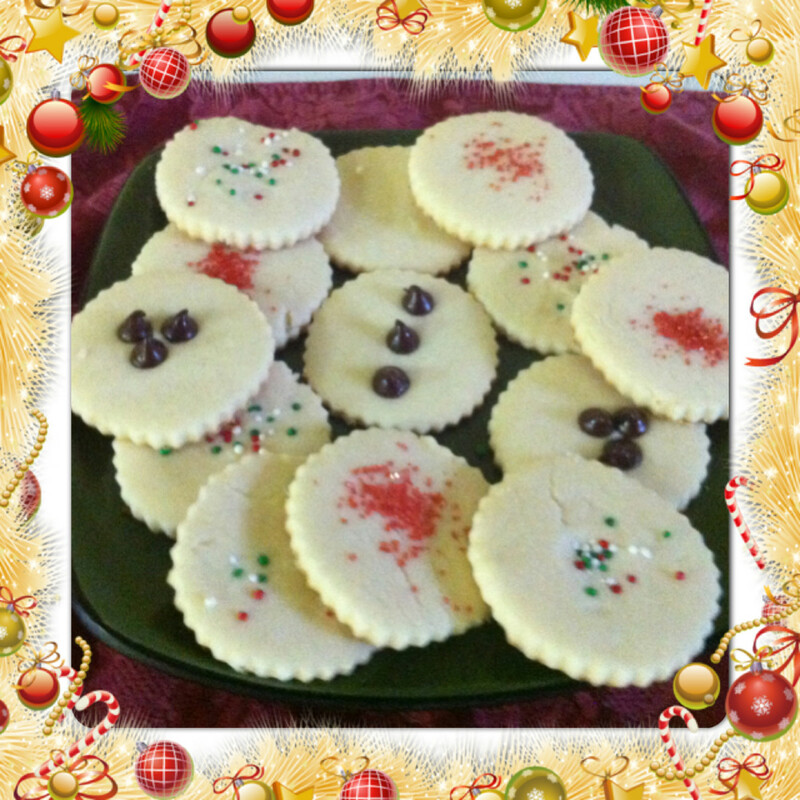 She describes herself as a self-taught, mom-taught, grandma-taught baker. I found her carrot bundt cake on Pinterest, and so glad that I did. 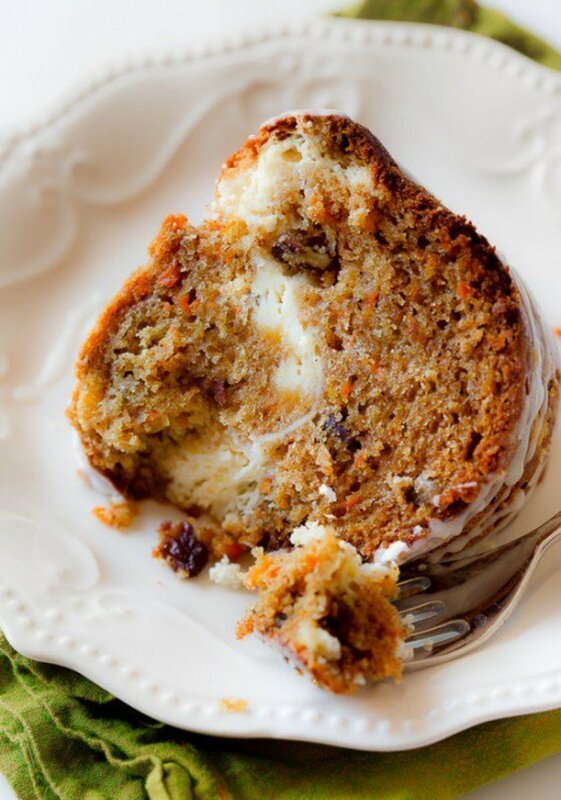 It's everything that a carrot cake should be -- rich, moist, and full of nuts and spices. Tracey of Tracey's Culinary Adventures was a guest blogger on bakedbyrachel.com. This moist and spicy cake would be a wonderful addition to your Autumn/harvest menu. Cheryl is the lady behind the curtain and the lady behind this beautiful photo and recipe. In the introduction to her blog, she states "...I strongly believe that one of the best ways we express our love for one another is through food." Dave Gonzalez is a food blogger in Seattle, Washington. He humbly explains that he is not a professional baker—he's just a guy who wants to bake everything and then blog about it. His recipe contains a cup of liqueur. How could it possibly fail?! Flourish, you make me laugh! Oh, stop it! This is too good! Yum, yum, yum! OMG, Diva! 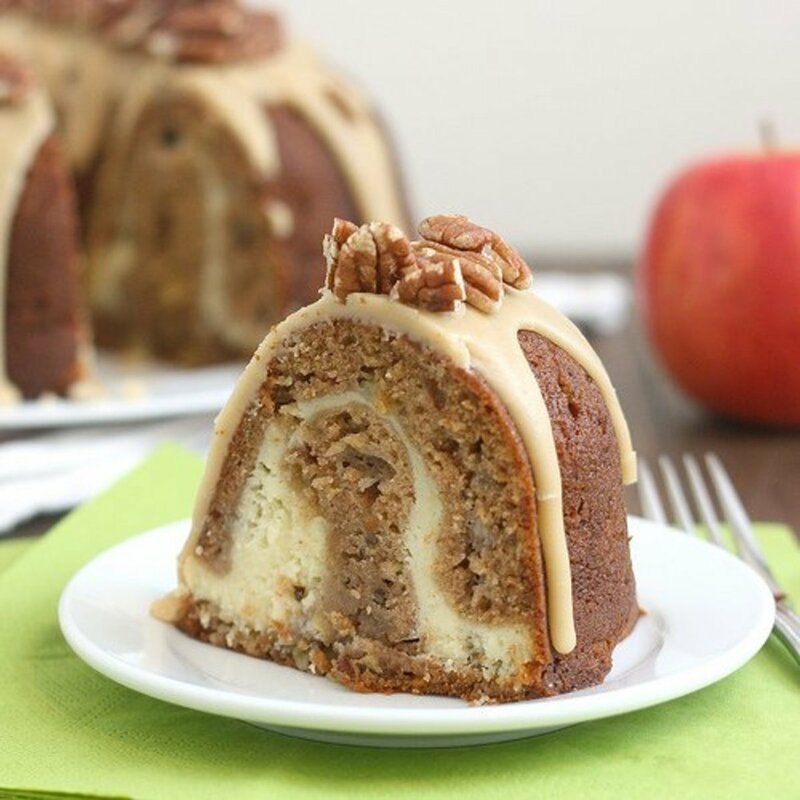 I'm salivating over the cheesecake swirl carrot cake and the apple cream cheese bundt cake! They look so delicious. My birthday's coming up. I just may have to bake myself one of these! This type of pan is also popular here in Brazil. There are a lot of Germans in the south of the country, that could explain why. 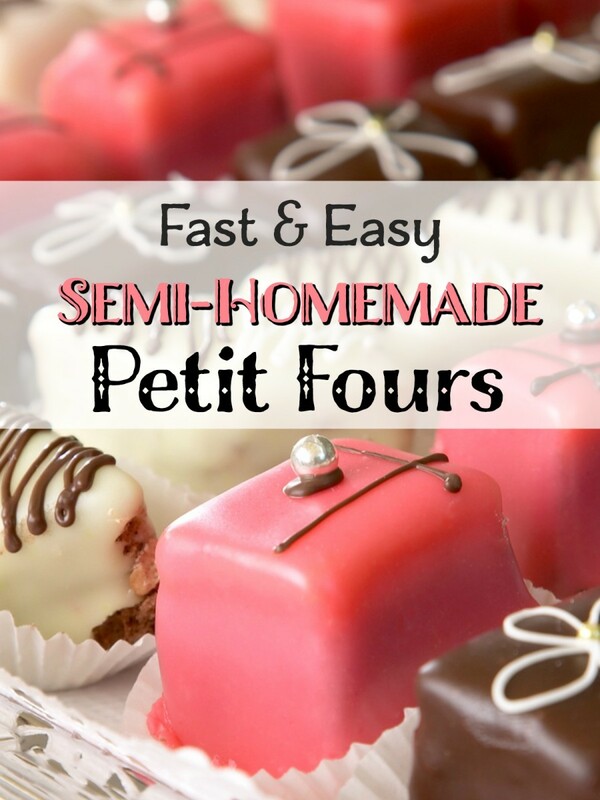 I am always looking for new things to try, especially desserts, so this is ideal. I guess I'd better go and buy a Bundt pan. Flourish - That sounds wonderful. 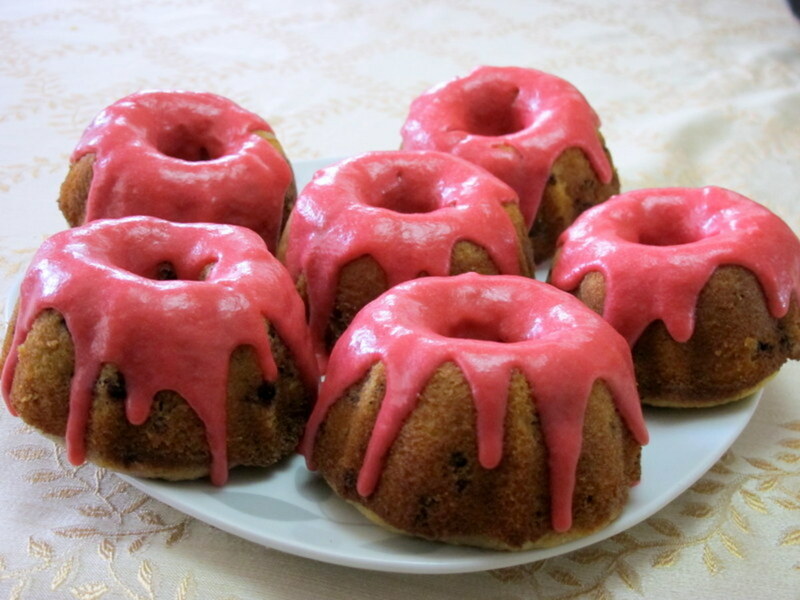 Another nice thing about bundt cakes is that they are easy to slice and serve. I hope the people whom you bake for appreciate you. Delicious! These are must-tries. I have a volunteer event check Ming up where I have the serv a bunch of people so I will use these to experiment on them. Yum. Kalli - I hope you get a chance to bake that cake, and let me know if you and your family like it. I love anything with coconut and chocolate! What a great hub...and I vote for the Almond Joy Bundt! I have a pan that belonged to my Mom, but I haven't used it in years. I may just need to do something about that. Well, Bill it's about time! If I didn't get to you with this one I was going to hang up my apron. Hope you have a wonderful day. I'm taking my older daughter shopping--today's her birthday! It is part of Americana and I love them!!!!!!! Eric, if I've made you think of your momma's baking that's an great thing! I've spent a lot of time on articles about stinky cheese and such -- who can disagree about cake, right? OMG - OMG my momma entered that exact contest. Fools did not recognize her German American ingenuity. But she won many other prizes from them. My moms creation followed all the rules but was created through the famed 14 pound Carrot Cake. This baby could be used as an anchor. I am not sure but I think she loaded up cream cheese in the funnel. Totally unconventional but wowsa bowsa it was good. Do not sit at the table and have to helpings -- not good. Linda you rock and keep on rocking.